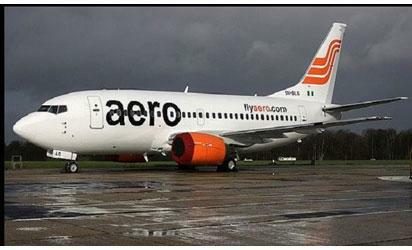 LAGOS—Aero Contractors Thursday recalled 69 workers affected in the redundancy exercise carried out in the airline in 2017. The management also revealed that plans have equally reached an advanced stage to recall another batch of 30 or more workers before the end of first quarter of 2018. It will be recalld that the former management of the airline had in March 2017 declared no fewer than 60 per cent of the workers redundant at the peak of its crisis in 2017 after all its aircraft were grounded. Mr. Frances Akinjola, the General Secretary of Air Transport Services Senior Staff Association of Nigeria (ATSSSAN), confirmed the development yesterday. He also confirmed that the management had assured the unions that other affected workers would be recalled in batches. Akinjola also hinted that the current management had paid all the outstanding salaries of 2017, excluding September to December of 2016, but said that the management of the airline has assured the unions that all outstanding salaries, benefits and redundancy packages would be paid in due time. He said: “We met with the Chief Executive Officer and management of Aero Contractors towards the end of 2017 and we go the intention that they were prepared to start implementing the agreement we reached at the end of the redundancy exercise that we concluded with them in 2016. “I believe Aero management will continue to call us for discussion and we believe that Aero is coming back stronger as envisaged. Our intention was never to see Aero go down and that was the reason we decided to work together with them despite the fact that some of our members felt we were not doing enough. “The only option left for us then was to shut down Aero, which we refused to do. If we had done that, what we are seeing today would not have come to light. I think we have been vindicated with what we are seeing today. “Aero is a very good brand in Nigeria aviation sector and as we all witnessed on the roll out of the successful C-check, Aero is coming back to where it used to be and we are even going to surpass that. Nigeria is even going to benefit from the MRO facility of the airline as pressure on foreign exchange among operators would reduce,” he added. The post Aero recalls 69 redundant workers appeared first on Vanguard News.